three posts in three days?! whaaa?? I know. cray cray. I haven't linked up with the ladies at Fine Linen and Purple in a couple of months, and actually I'm pretty sure I've only done one other of these WIWSs....I usually peruse through the link-ups but just can never find the energy to take pictures of myself. SUCH a hard life. but seeing as it's Papa Benny's last Sunday as Pope, I thought I'd give it another shot. As some of you might know, I work for Students for Life of Illinois...in a nutshell, I work with pro-life college students...so when they have an impromptu very important meeting, even if it's on a Sunday and I don't work on Sundays...I show up. 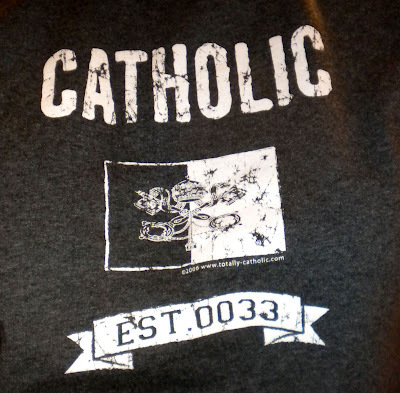 In honor of B16, I wore my fav Catholic t-shirt today to our meeting....which began at 1pm....aaaand didn't end until 4:30......aaaaand mass was at 5:15 across town.....aaaaand so while I felt like a total slob, I decided it was better for me to be super casual and have time to pray before mass than go home and definitely be late. I'm very sad to see Pope Benedict retire, though as we approach his stepping down and the *gasp* empty seat of Peter, I'm filled with an Easter-like hope and joy. I know that I will love our new Pope just as much as I've loved the other two Popes of my lifetime. A couple of my students had this question today, to which I did not have an answer, maybe someone can answer it....during the period of time in which we do not have a Pope, during the mass, what will the priest say during this section of the Eucharistic prayer? "...together with your servant N. our Pope and N. our Bishop..."
That is one awesome shirt! I'm on the oldish side for it, but I would love to find one for my son...thanks for listing the source! Thanks for sharing! It was a fun visit! 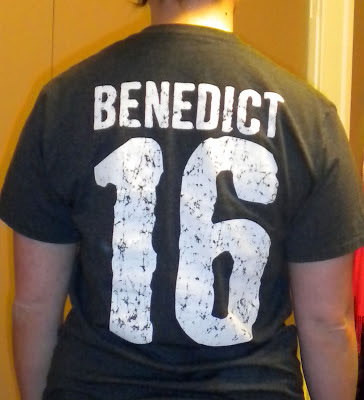 That tee totally excuses jeans and a tee :) Yay Pope Benedict! Can't believe that this was his last Sunday as el papa. Cute cardi too! 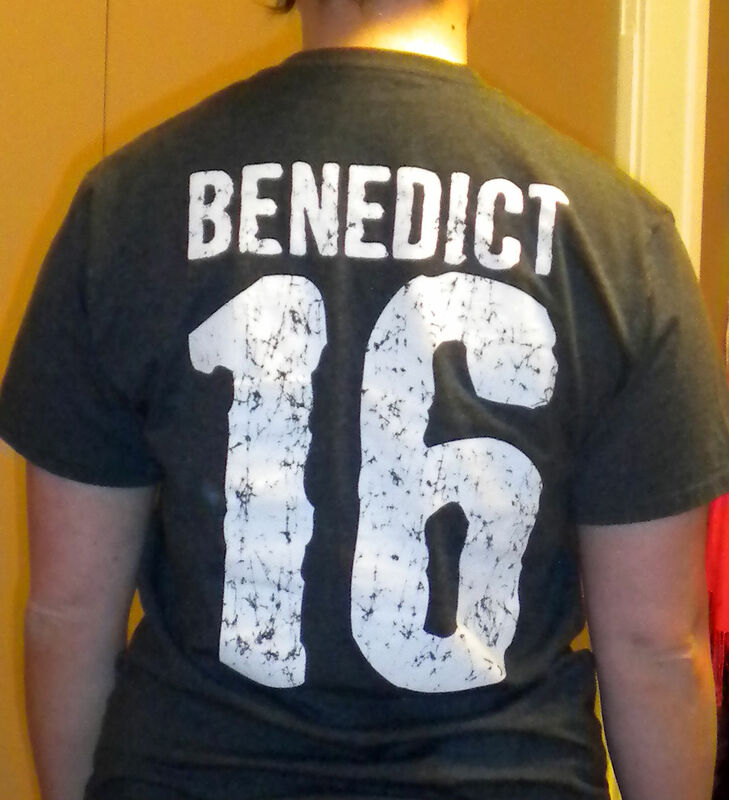 LOVE the shirt! Love what you do for a living! Praise God for you and those on the front lines! Yay for B16! !